Could a molecule triggered by running help treat MS? Dr. David Picketts’ team discovered in 2016 that a molecule triggered by running can help repair certain kinds of brain damage in animal models. The molecule, called VGF nerve growth factor inducible, helps heal the protective coating that surrounds and insulates nerves called myelin. Now the team has been awarded $312,000 by the Multiple Sclerosis Society of Canada to explore whether this molecule could potentially heal damage to this myelin caused by multiple sclerosis. They plan to uncover the molecular pathway that leads to myelin repair and find out which cells are targeted by VGF. 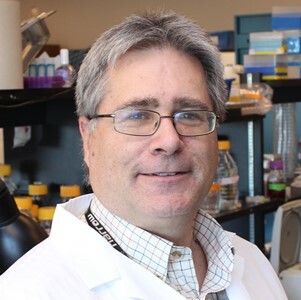 The team will also test whether injections or delivering VGF through the nose can help prompt the repair of myelin in an animal model of MS.
Dr. Picketts’ research is possible because of generous support for Regenerative Medicine at The Ottawa Hospital.